Some Swiss data vaults are located in exotic locales like a massive high-tech underground bunker used by Deltalis, which brands itself as "the most secure data centre"
Switzerland, facing an erosion of the banking secrecy laws that helped make it the world's banker, is now touting its reputation as a safe and stable haven to become a global data vault. More and more companies are flocking to the wealthy Alpine country to stock data in an era of increasing espionage and hacking, and the Swiss are reaping the benefits of the paranoia. 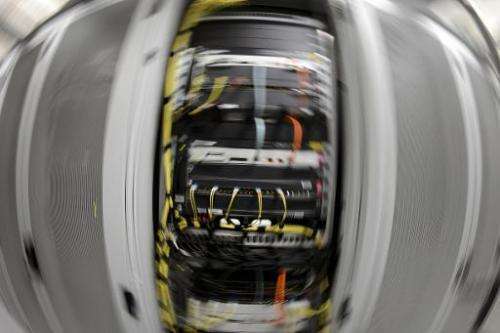 "Data storage is the new Eldorado for Switzerland. It's a real boom," said Franz Grueter, the managing director of Green.ch, a leading data storage firm that has posted 30 percent annual growth since it was set up in 1995. Thanks to Switzerland's long-held banking secrecy tradition, the country enjoys a global reputation for security and privacy. But amid international pressure, the country is being forced to shed the protective shield that has made its banks so attractive, and has agreed within the next two years to automatically exchange account details with other countries. While Swiss banks are suffering, the country's data storage companies are booming. In the wake of revelations from former US intelligence contractor Edward Snowden of widespread snooping by the National Security Agency, they are touting Switzerland's cherished reputation to draw clients from around the globe. "Clients need confidence, discretion, reliability and stability. These have been the country's hallmarks forever," said Grueter, who says more than one billion francs (one billion euros, $1.1 billion) have been invested in data centres in the country over the past five years. With its 61 data centres, tiny Switzerland is currently Europe's fifth largest data hub, according to the Data Center Map website. Jean-Philippe Walter, the federal official in charge of data protection and transparency, said it was in Switzerland's interest to offer clients a higher degree of protection than in other European countries. Swiss laws on the issue are one of the most restrictive in the world: Personal data is defined as a "precious good" that can under no circumstances be handed over to governments or authorities without authorisation from a judge. This has been a magnet for companies such as Multiven, an IT services firm that quit California's Silicon Valley in 2009 for Zurich. "We relocated to Switzerland in anticipation of this future and to lay the ground work for it," Multiven's chief Deka Yussuf told AFP. "We foresee a future whereby individuals, businesses and organisations worldwide will seek to store their digital assets (intellectual property, inventions, trade secrets, etc.) in Switzerland," she said. Deka said this would transform Switzerland from a haven for storing physical assets such as works of art, gold and liquid cash to a hub of data storage. "Within the next 25 years, a majority of the of assets that will be saved in Switzerland will be digital rather than physical," Deka said. ProtonMail, a free web-based mail service offering client-based encryption to protect emails and data and which counts more than 300,000 users around the world, says that is why it chose Switzerland for its base. "The culture of respecting privacy is very important," said ProtonMail chief Andy Yen, pointing out that recent proposals from Washington and London to ban encryption "would be unthinkable in Switzerland". But experts say that in today's rapidly changing electronic world, nothing is 100 percent foolproof or safe. "We have to admit that in our present societies, total and absolute protection is impossible," said Jean-Henry Morin, a professor of information systems at Geneva University, referring to the recent cyber attack on Sony, the biggest in US corporate history. 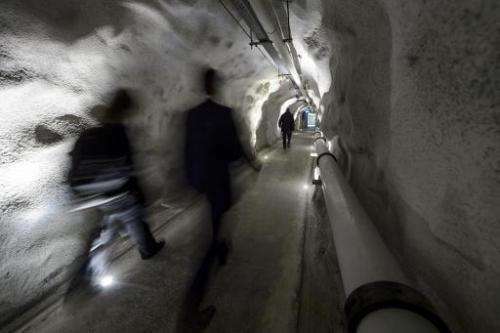 Some Swiss data vaults are located in exotic locales like a massive high-tech underground bunker used by Deltalis, which brands itself as "the most secure data centre". Housed in one of the country's numerous Cold War era army barracks, it is tucked away from view behind four-tonne steel doors built to withstand a nuclear attack. The tight security includes biometric scanners and an armed guard while its exact GPS location remains a jealously guarded secret.